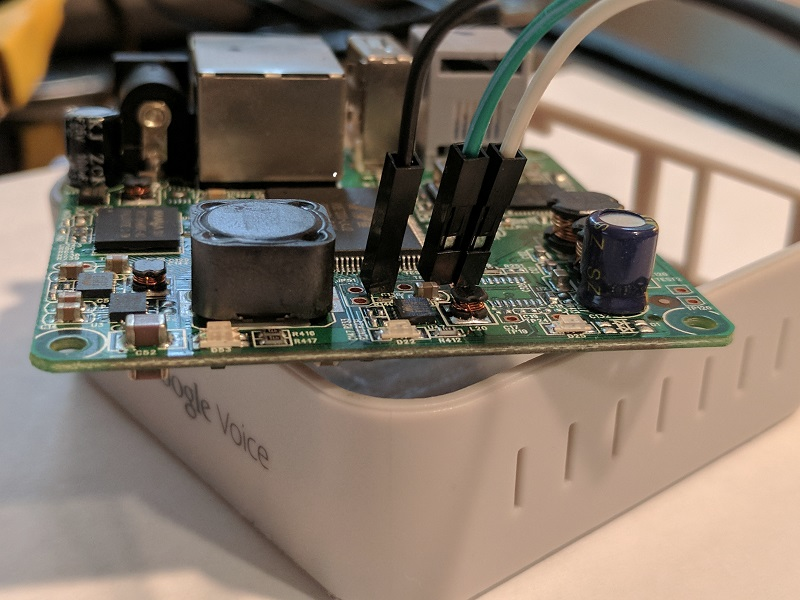 In part 1 of this post, I wrote about analyzing the firmware of the OBi200 and getting a root shell leveraging an existing RCE vuln. 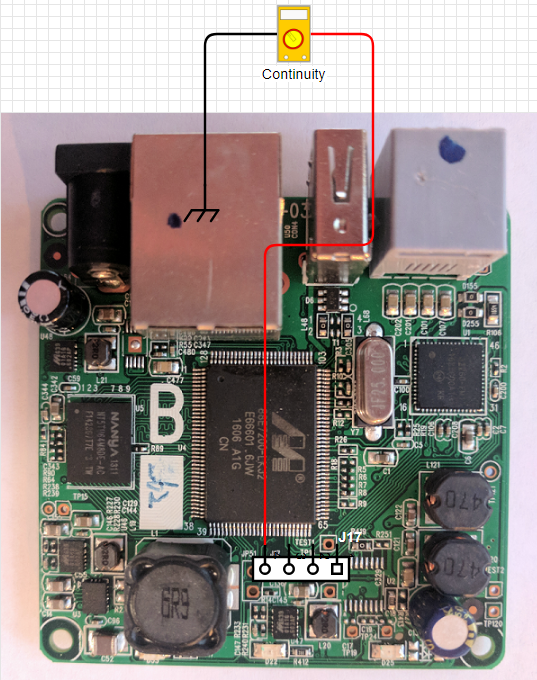 In this post, I’ll cover the process of identifying the serial port pins and connecting them to get console access to the device. 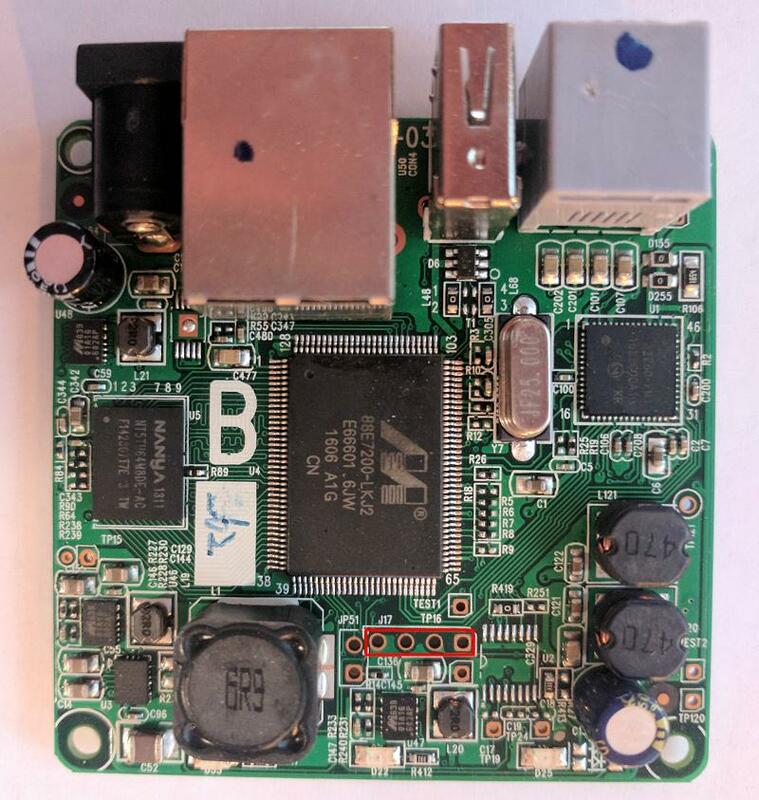 This is a good head start as it discloses two important details: first, it confirms the serial interface is an 8250 UART which helps narrow down the search for headers (UART is typically four pins at minimum); second, it provides the baud rate. This is all the information needed to connect to the console from a software protocol perspective. As you can see, most test points are well-labeled and the only four-pin header on the board is J17. Also note its right most pin pad is square, designating it as pin 1. Pin 1’s activity was unique from the others — its fluctuations in voltage were likely signal data transmissions from the console port (the Tx pin). 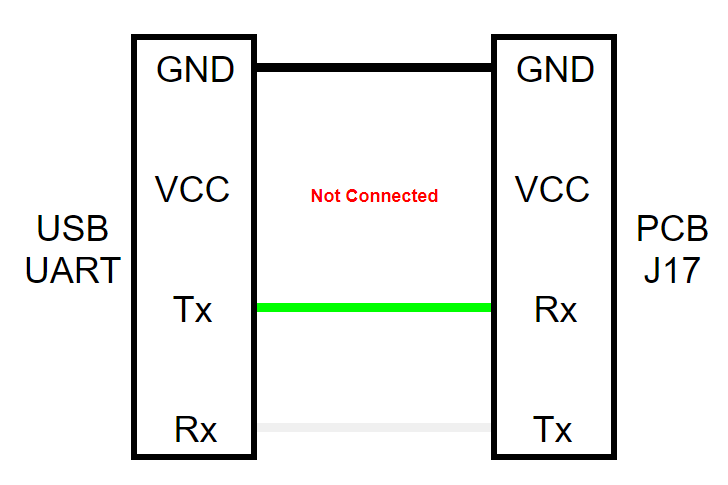 The voltage measurements of pins 2 and 3 were quite close, but there was enough of a difference to identify them: pin 3, measuring at a full 3.3V, was indicative of VCC; pin 2, hovering just under VCC, represented Rx (the only remaining choice). 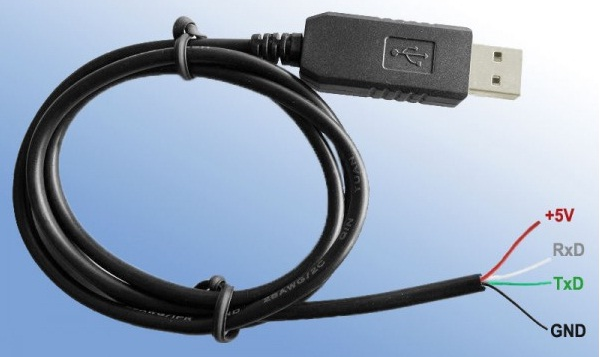 It’s important to note that while pin 3 (VCC) won’t be used when connecting the USB UART adapter pictured above, identifying it helped eliminate it as a possible candidate for Tx or Rx. 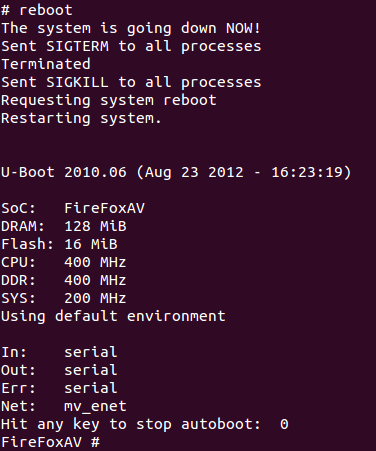 I hit enter a few times and got a root shell prompt, meaning I had console access — no password needed! Note the telnet daemon is launched during boot up — it’s killed during the launch of the OBi Daemon which I learned while researching the startup scripts in the previous post. 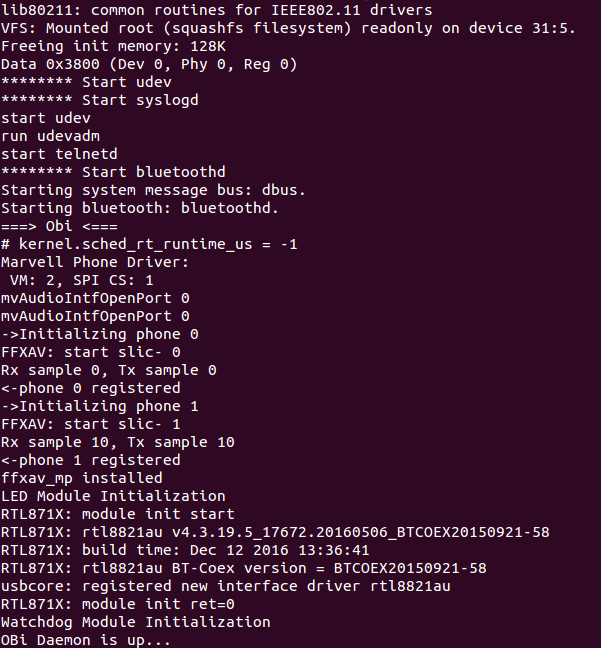 Now that I had root console access to the appliance, I wanted to dive deeper into its running services and the obiapp binary. 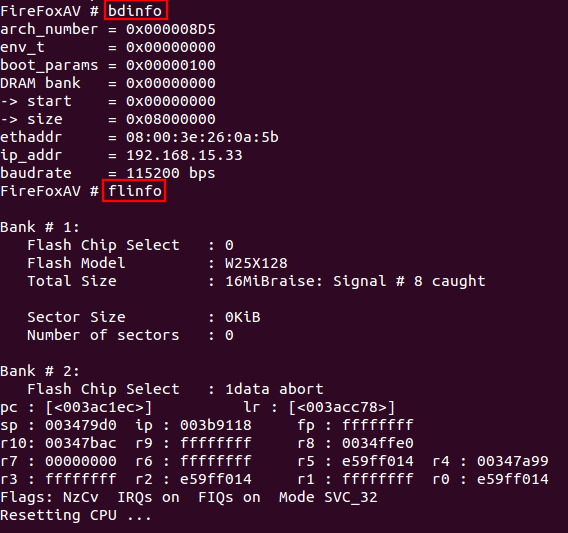 In part 3 of this post, I’ll cover cross compiling gdbserver (and other tools) for the board as well as debugging crashes of the OBi binaries.